La Salle is said to have departed onto the mainland while the ship and her crew of six were to sail on a return course. But Le Griffon would never be sighted again, leading to wild speculation over the years. One story that La Salle became aware of months after the disappearance tells of a nearby village that encountered a group of natives with French captives who were armed with explosives and furs, both items on both Le Griffon. This tale would lead La Salle to believe that his crew had mutinied on him, attempting to make off with the valuable load of furs to trade on their own. Le Griffon is a fascinating case because it remains unsolved to this day. Many have claimed to find parts of debris from the 17th century vessel, but only one individual’s claim to date has not been debunked. Steve Libert has spent over two decades of his life searching for Le Griffon, and in 2001 he literally ran into what might be the last piece of evidence of its tragic demise – that's right, in low visibility Libert actually swam headfirst into what researchers are describing as a bowsprit, the part of a ship that extends outward from the front of the ship (the prow). If this is the case, the entire rest of Le Griffon might be buried in meters of thick sediment. Perhaps if the ship is ever recovered researchers might be able to finally piece together the puzzle of what happened that fateful day in 1679. November is a notorious month for the Great Lakes vanishings. In November 1875 the Cornelia B. Windiate set sail on Lake Huron, but she would never make it to the harbor again. It is said that the Windiate hit rough waters but the exact cause of the sinking remains unknown. To this day you can visit the wreck that lays 180 meters down, her cargo of wheat still perfectly preserved and her three masts standing proud, only deepening the mystery. While this wreck has since been discovered the mystery remains as to what caused her demise ultimately. At the time, many sailors speculated that it was very unusual to have no sign of debris, leading some to believe that the Captain had simply abandoned his company, repainted the ship in an attempt to disguise its true identity and sailed away into the sunset! Others believed that the schooner had encountered a much larger steamer that may have run it down, the Captain then swearing his crew to secrecy. While both of these seem highly unlikely, the mystery only deepened over the years as no evidence was revealed from the depths of Lake Michigan. Into the Twentieth Century, the number of mysterious disappearances on the Great Lakes continued to grow in numbers. The wreck of the SS Kamloops in December 6 1927 that sunk under mysterious circumstances wasn’t discovered until the 1970’s. The Kamloops has since gained notoriety amongst divers who discovered the eerily well-preserved corpse of one of the crewmembers – but that's not all! Explorers relate how the ghost of Old Whitey, as he has since become known, remains with the ship, a friendly, harmless spirit that is said to follow his visitors around as they explore his final resting place. Other notable wrecks discussed on this week’s podcast included The Bannockburn on November 21, 1902, where the only debris ever recovered was one cork life preserver washed up on shore the following spring. The Bannockburn is often referred to as The Flying Dutchman of the Great Lakes because of the many sightings of a ghost ship over the years since it’s disappearance. One of the most notorious disappearances in Great Lakes history was the Edmund Fitzgerald on November 9 1976, a tragedy that has since been memorialized in Gordon Lightfoot’s classic song, The Wreck of the Edmund Fitzgerald. For an in-depth look at this case be sure to tune in to this week’s episode of the podcast! 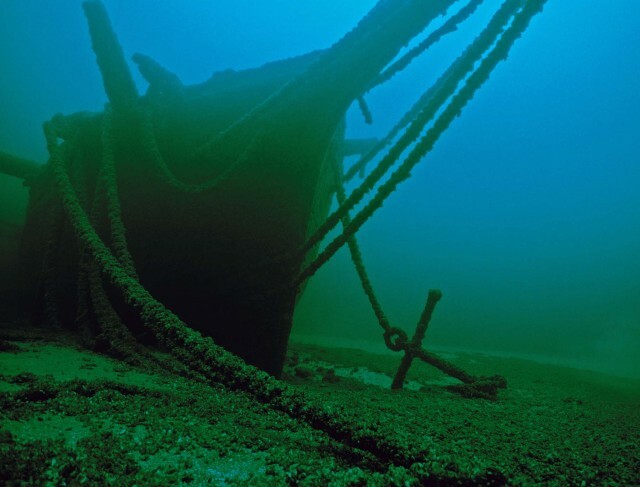 One aspect that is important to remember when examining the Great Lakes Triangle is the memory of all the souls that have perished in these disappearances and wrecks over the centuries. Many individuals have never been recovered, making the Great Lakes their final watery resting place. We must never trivialize or overlook the memories and contributions of these brave individuals who dared to confront the dangers of these unpredictable bodies of water. A special dedication goes out to this week to Jake, we love you and your memory lives on forever in our hearts.